The organization kick continued on Sunday and after I fixed up my vanity I realized I need a home for all of my necklaces. So into the garage I went and I found all the tools I needed to make something quick! Using a piece of left over homasote from an old DIY project, a stapler gun and some leftover grass cloth ceiling. Ta da you are almost finished! Now just nail it into the wall. We just used 4 nails and tacked them in the corners. *Excuse my sparkly walls. We did a candlelight technique in the room and when the flash hits the sparkles come out! So easy and it cost me nothing, because it was all supplies that I had around the house. Fabulous! I have tried something similar in the past but found that some of my necklaces were a bit too heavy for the push pins. Any thoughts on a sturdier option? I love it! Your collection of jewelry is beautiful! I have a similar set up in my closet and used hook eye (? I think that's what they're called) and they are really sturdy and work well. omg, i need one of these so bad! 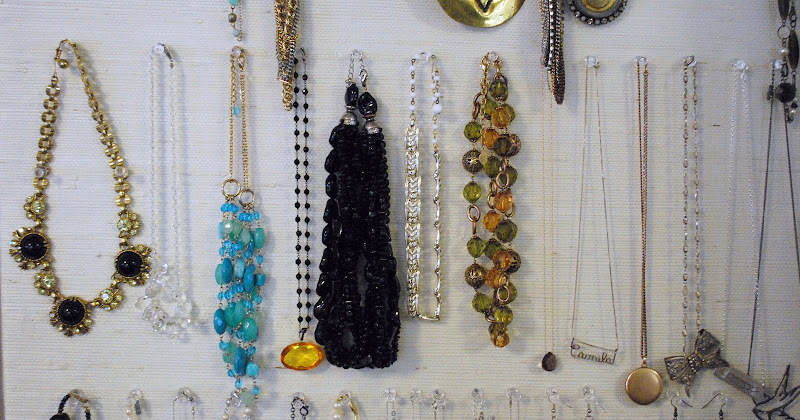 i have so many friggin necklaces and i need a cute way to display them- love this!! So when should i expect you to come and install one for me? Next week you say? ok perfect, see you then! Great idea Jenn. I was going to mention eye hooks. I was trying to do my budget with things I had at home so push pins worked for me. I have a couple of heavier pieces on the board and I just a couple of push pins throughout the piece to hold it in place. Linds I keep telling Jon he needs to surprise you in Boston one weekend and do projects for you! Looks great! Is it hanging in your bedroom or bathroom? I'd love a big board like that, but there is no room in my bath or closet. It's hanging behind the door of my bedroom. It works perfectly there. 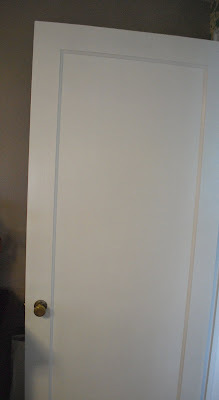 I can get to it when I need to, but during the day while my door is open it doesn't look like a totally girly room so my husband is okay with it. very smart and exactly what I need!! Great project, that even I could possobly accomplish!! Hi, I just stumbled across your blog today and am so glad I did! This jewelry hanger looks too cute, I might just have to use something similar for all my long necklaces that are currently stored in a drawer. I feel like when you see them on display you are more likely to come up with fun combinations to outfits! 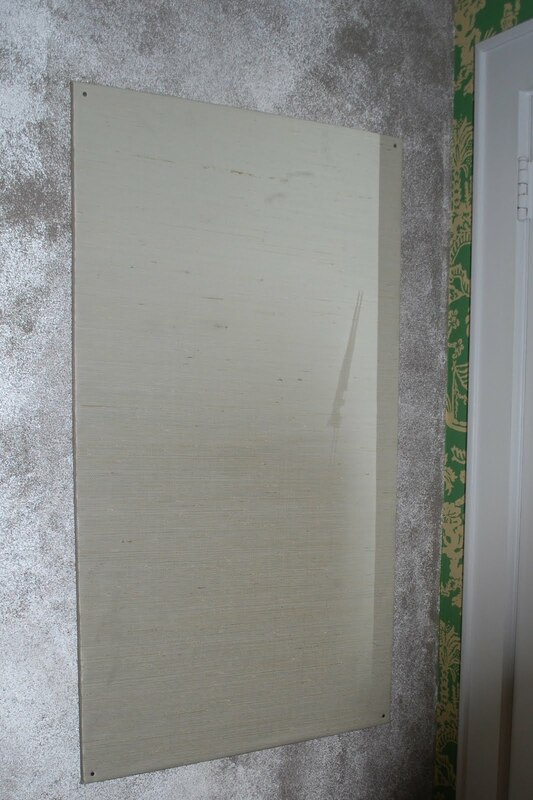 I made a pinboard for my living room covered in cotton duck. Used spray adhesive and lots of nailhead trim. After I hung it, the fabric (which seemed really stretched tight before) puckered. Have you had this happen? I am known to be a little uptight about details....so I might be the only person this bothers. Or do you have a trick :)? you are full of great ideas.. love this one. thanks! Camila- The perfect ying to the yang of your newly organized jewelry drawer! Beautiful! Looks really pretty!! I can't wait to see more of your bedroom! Hmmm... I might have to do this! Great idea. And wish I had so many great necklaces, etc! LOVE IT! I am in the middle of some jewelry organization too.....pvc pipe...might have to do a post. You are on a roll! Love this! So functional! I love a DIY using items you already own. Those are always the best, aren't they?